I have struggled with dyslexia for my entire life. School—because it involved reading and writing—was a nightmare for me. But I survived and even learned to thrive. 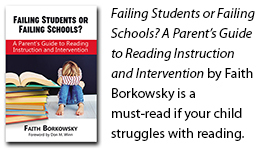 Now I try to share helpful information as a dyslexia advocate so that parents and educators can help their dyslexic children and students to understand the condition and work with it with patience, optimism, and perseverance. I’ve written many blog articles and magazine articles about dyslexia. I hope that some of the following archives will be helpful to you and your family. Motivating Struggling Students: Does Word Choice Really Matter? Boon Philanthropy is committed to helping ALL kids learn to read adequately. Find out how you can help support teacher training in explicit, multi-sensory literacy instruction.